A take on the classic tomato soup and grilled cheese. In a large bowl, combine 3 teaspoons oil, onion, garlic, peppers and tomatoes. Transfer mixture to a roasting pan and roast in oven for 30 minutes, or until vegetables are fork tender. Transfer vegetables, tomato paste, 2 tortillas and salsa to a blender. Puree until smooth, transfer mixture to a medium pot. Add water and spices. Bring to a boil and reduce to a simmer, continue cooking for 30 minutes. Season to taste with salt and pepper. Place eight tortillas on a parchment-lined baking sheet. Place 1 piece of cheese on each tortilla and fold tortilla in half; drizzle 1 teaspoon of oil over tortillas. Bake for 10 minutes. 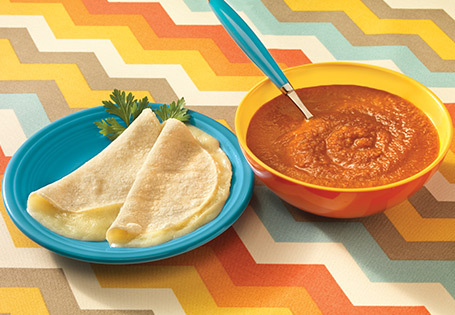 Serve soup with quesadillas.